Q: Should I RSVP or just show up? A: If you received an invitation in the mail -- RSVP to the number printed on the invitation. Please. As soon as possible. No kidding. It really helps us to plan ahead if we know you'll be there. If you didn't receive an invitation in the mail, please don't just show up. Q: Can I bring a date / spousal unit / friend / companion / etc. ? A: If they can have fun without trashing our home, yes. Q: Lots of friends, relatives or out-of-town guests? A: Our space does have its limits, so please call and ask. Q: Should I bring something to eat/drink? A: You do not need to bring food to the Drum-Out. We'll have lots of famous Juline Cuisine. Just bring something to drink and, if you would, a non-perishable item for the Marin Food Bank. Q: Is it really, really noisy? A: That depends. The Living Room can get pretty noisy. The Studio stays pretty quiet. You can wander back and forth and see what you like best. Q: Can I bring my own instruments? 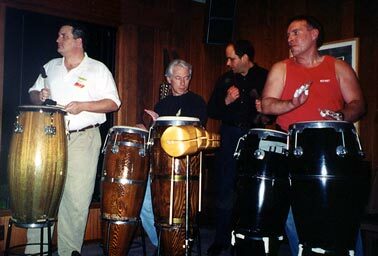 A: We'll have lots of percussion stuff available for you, but if you have something non-electronic that you'd enjoy whomping on for a while, feel free to bring it. Please remember that some of the instrumetns involved have gotten wounded, so you might not want to bring anything fragile, valuable or sentimental. 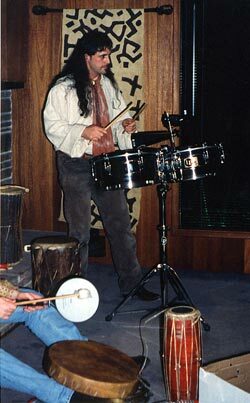 Q: What does the Palm Print on some of the instruments signify? A: It means to please use hands only  that means no sticks  on that particular instrument. Thank you for not breaking. Q: What if I don't know how to play? A: Nonsense. Everybody does. Start slowly. Listen more. Play less. If you can't hear those around you, maybe you're playing too loudly. Find the more subtle sounds within your instrument. Leave space in your playing for dialogue. The best conversations have a lot of give and take. Q: How can I get everybody to play "On the Beat"? A: Wow. That's a hard one. Trying to get a room full of people to play it "right" often just leads to more noise and frustration. Try making eye contact with those around you. Listen to what they're playing and interact with them. Sometimes, things just happen. Q: Is this some kind of "Shmooze-fest"? A: No. Please do not talk biz at the Drum-Out. A: Well, if they have to do with the Drum-Out, you can always call Joe. 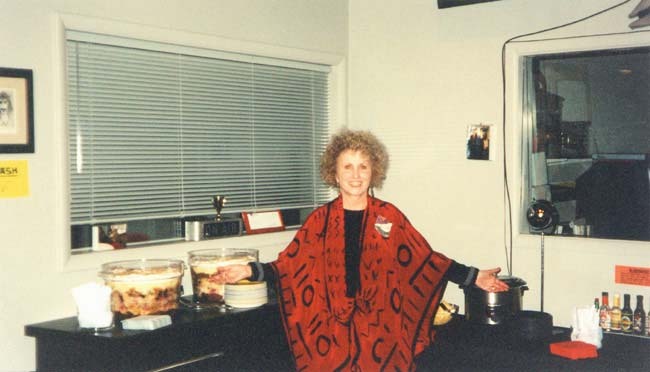 Juline proudly displays an assortment of her world famous Juline Cuisine, including the Calorie-free Miracle Trifle. Site created and maintained by Bill Krauss. Enjoy.